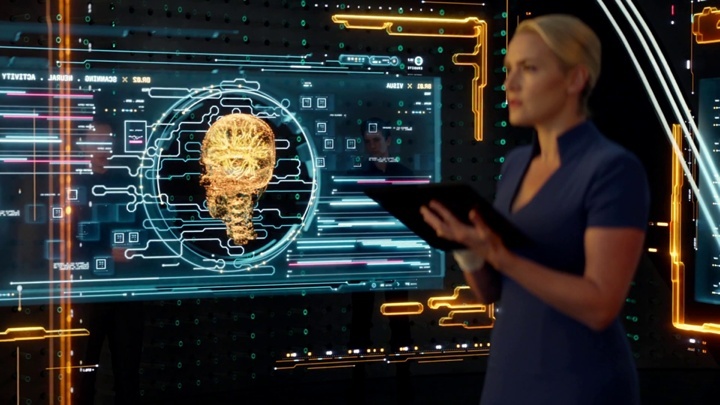 The last decade has seen a surge of interest in exploring holographic interfaces in major sci-fi movie productions. Anna Fraser is at the forefront of this wave, and you can see her work in “Ironman 3”, “The Hunger Games: Catching Fire” and “Insurgent”. In this interview she talks about what goes into creating holographic interfaces, from the initial exploration to subsequent collaboration with multiple departments, working within the post-production constraints of existing actor movements and eye-lines, her love of a strong grid and minimalistic, retro-futuristic interfaces, how people see and perceive color, and how the screen graphics work fits into the much larger flow of story-telling on the big screen. In the last part of the interview Anna talks about the evolution of technology on-screen as well as in real life, advances in virtual reality hardware and software, their possible implications on the fabric of our social interactions, and how, despite all the changes in the world of digital tools, the art of story-telling transcends technology boundaries. Kirill: Please tell us about yourself and your professional path so far. Anna: My name is Anna Fraser and I live in Sydney, Australia, which is a long way away from America where these things are made. If we’re talking about screen graphics and holograms, I ended up doing them kind of by accident. I originally studied visual arts, and I had a child when I was quite young. I was making art and having small exhibitions of bronze-cast sculptures and other things, but I couldn’t make any money. I had always liked movies so I decided to become a director [laughs]. Somehow I thought it was going to make me money; I’m not sure what I was thinking. I went back to university and I did a communications degree in film, media and writing. A sort of a broad postgraduate, and then I started making short films. I then went to the Australian Film, Television and Radio School, which is one of Australia’s best film school. Everybody knew that once you got into the Film School, they would give you money to make films. You also didn’t have to pay money to go there, so I thought it was a great idea. I wanted to do directing, and that was hard to get into. It was very competitive, so the back door into it was to do another subject. I did digital media back then, around 2000, when it was starting to take off. I studied titles design, because I always loved graphics and text, and I was working doing part-time jobs in outdoor advertising and billboard art, which was very boring but functional in earning money. I still thought that I’d earn money being a director. I made some short films and they all had titles and graphics in them but they weren’t straight visual effects and they weren’t straight live action, but rather a combination of live action and titles. I kept making short films and when I graduated I started working as a motion graphic designer as a day job. I thought it would be my day job and I would continue to make films. Kirill: And that was around time when computers got reasonably powerful and cheap to be able to afford having them as your own personal tool. Anna: The first films that I’ve made were made on 16mm or 35mm film, but by then you could buy reasonable cameras that weren’t too expensive. I also had a lot of friends that were in the film industry, and you could always beg or borrow some ridiculous gear that you couldn’t afford. Kirill: Back then you didn’t have the variety of digital cameras and tools available these days. It must have been more expensive to be an indie filmmaker 10-15 years ago. Anna: I was working as a motion graphics designer and trying to make films and also being a parent. It was very expensive. You could often get good deals, but I spent an awful lot of money on films, which is silly really. Something had to give. So I decided, and I found it quite hard at the time, to not be a Director anymore, and just be a Designer. The Designer road is a hard enough in itself, and since I didn’t come from a traditional design background, I did a lot of learning on the job. I had all the formal qualifications of creating ideas and images, balance, shape, form etc. but it took me quite a while to understand the communication aspect of design. I made a lot of mistakes [laughs]. Kirill: Lucky for you there’s a lot of people on the production around you. Anna: At that stage I was working in television, print and advertising, and I made quite big mistakes but I had good friends who, in one instance, did work out jobs for me and literally saved me. But I learned from them, and I learned from all the people around me. I started doing a lot of freelance work for a company called Fuel VFX in Sydney. I worked for them on and off for quite a long time and I was getting better at being a Designer. I love film and the storytelling side of it, and fortunately for me Fuel was working on VFX [visual effects] and design for films. I mostly worked with Paul Butterworth who was one of the Founders & Directors at Fuel. He comes from a solid art and film training background as well and I found that it was good to work with him. I still work with him on all my film projects; he’s my main VFX supervisor and my main team member that I work with or for. Kirill: Do you think that the timing coincided with desire from producers and directors to use more technology into the films, to bring more computer-generated screen graphics into their productions? Anna: It’s interesting, isn’t it? It did sort of explode. I think people are really educated in a visual sense about the possibilities of computer graphics. We all look at our computers every day, and everyone’s using them every day. It’s not uncommon or strange to people. Nearly every film has something in it these days. Kirill: Especially films set in near future or even the present days. It’s hard to depict the present without computers around us. Anna: That’s right, we can’t. If you’re making a period film from the past, that’s the only time you’re not showing any computers. And when you watch a film and they don’t have mobile phones, you start to wonder what time frame the film is set in. It’s just so normal now that when it’s not in a film, you really notice the lack of technology. Kirill: So at Fuel you got back into the film world. Anna: I was lucky to work with them and then when they moved over to Animal Logic I went with them and continued to work with them there. I mostly work with the team of Paul Butterworth as the VFX Supervisor and executive producer Jason Bath, although on Insurgent I also worked with the VFX Supervisor Kirsty Miller. It is a really good team and a really solid teamwork event, which is what I love about film,it’s not just one person doing something. You’re solving problems all together. That’s what I like about film, I’ve always liked the collaboration. Kirill: And you’re also a smaller part of a much bigger production. You did Iron Man 3, Insurgent and the second Hunger Games – is there any similarity on when and how you start? Anna: I usually get a very good brief from my VFX Supervisors who get a brief from the VFX supervisor or Director of the film. I’m put on as the designer, or lead designer, or motion graphic designer or whatever else – it changes every single time and I don’t know what you’re supposed to call yourself anymore. Designer of holograms is usually what I say [laughs]. Sometimes you get the breakdown of the plot and the storyline but often with films today, they’re shooting and editing while you’re designing and making what you think will be in the final film. Often they can’t give you anything exact. 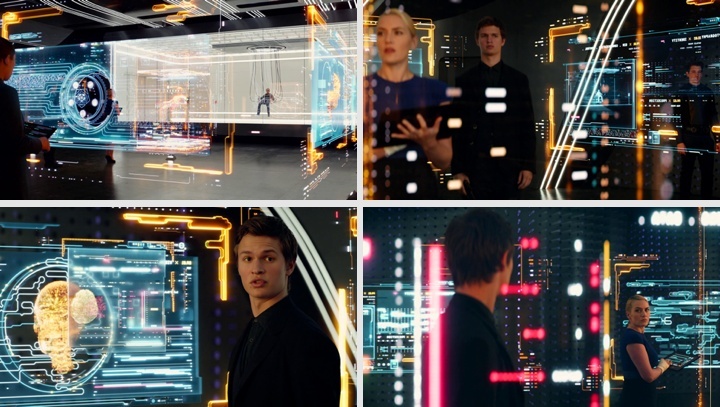 For example, on Insurgent we had Jeanine’s lab, and we knew that it had to be filled with holograms, and they are all very, very story-specific, but you don’t necessarily know how the final edit is going to end up. Kirill: So that means you’re not doing anything for on-set, and everything is in post-production. Anna: Yes, we always work in post-production. But having said that, the one thing we’re always saying is that it would be nice to be working closely with the production designer. Sometimes they’re doing one thing, and when it arrives in post-production, we see the lights are up too high or something. Then the production design and the post-production design don’t necessarily fit as nicely together as the possibilities for that could be. Kirill: And most of the time the production designer doesn’t stay into the post-production phase, and the responsibilities are transferred to the visual effects supervisor. Anna: Yes, I work with them. I guess they are a bit like very technical production designers. It would be interesting to have a production designer that could go through the whole thing, from pre to shoot to post. But I guess the business model doesn’t allow for that, and also everyone is in different parts of the world. Kirill: Going back again to your work on Iron Man 3, Insurgent and the second Hunger Games, they are all part of the larger franchises that had previous installments that defined a certain visual language for the story itself, as well as for the screens in those universes. What kind of research do you do? Anna: On Iron Man we had a stand alone section which wasn’t about his suit. It was at the beginning of the movie, a sort of a premise for the whole thing. We had a big blank room where we could come up with something that didn’t necessarily relate to the other previous installments in look or design. Usually the research period starts with looking at all sorts of things – visual research of how things look like, how things interact with people. You have to understand how it’s going to work, how it’s going to move and it’s actually very abstract and not always very clear. In the beginning you’re finding things that are really out there and if it’s called for, you look at what people at universities and research labs are doing. It’s like a painter – if you want to paint in an abstract form, then you need to know how to paint realistically before you know how to abstract it. You need to know all the information so that you can then discard it. Really, in the end, a lot of things that you collect don’t end up in the movie. Usually it’s a process of making a document with reference material and moodboards etc. sending it to the director and production in LA or wherever they are. Then it’s a process of elimination from there – what they like and don’t like. And then you do it again, slowly whittling it down so that you can understand what the director is thinking. It would always be nice to have more time, but it depends on a project. You might get a couple of weeks, sometimes it’s more but it depends on when you are put on in the schedule and what the budget is. The brief we had for Hunger Games was pretty minimal, and I have to say that it was a pretty smooth flowing job. I didn’t do a huge amount, but what I did do I really liked. It was simple and I enjoyed it. Basically the brief was retro-futuristic, and that was it. I also think they gave us the poster to look at – a sort of white minimalist architectural space. But having said that, it was very succinct and I knew what they wanted. They had a visual style pretty well set. I looked at a whole lot of things from brutalist architecture to all sorts of strange stuff like the Hadron Collider and Geodesic domes from the 60s . You extract shape and form and architecture and off you go. Kirill: If you do your work in post-production, then it means that on the set whoever happens to be the lead actor or actress wave their hands around in empty space and then you need to conform to those gestures and build interfaces around them. How does that work for you? Anna: That’s an interesting thing, isn’t it? I’m only speculating on this having done some live action directing myself, but you really want the performance of your actors to be the best it can be. I guess that’s why they allow the actors the freedom to experiment and do whatever they’re going to do, and I completely respect that. But it can make it really difficult, particularly with simple things like eye-line. When it’s off, your whole screen is not quite right, because they’re looking just a little bit over there when before they were looking somewhere else. It can be a little bit challenging but that’s just part of a jigsaw puzzle, of putting it all together. As a designer you’re used to having constraints. Having constraints actually makes you a better designer. So it becomes one of the constraints you have to work with – how to deal with random movements and random eye-lines from actors. I don’t mind that. Kirill: If we talk about your particular part of the production – designing holograms – those have a lot of spatial complexity introduced by the additional dimension. How difficult is it to design interfaces in a three-dimensional space? Anna: I’m very lucky that I always work with Houdini and Maya artists. The things that they can do are just amazing. When I work on films, it’s usually a collaborative event. 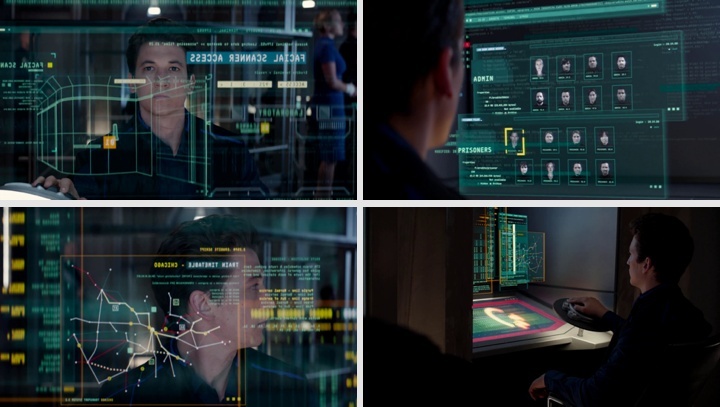 For example, I designed the actual screens, graphics and styleframes for Insurgent in Photoshop and Illustrator. We know what we have in the room, and then it’s a process of collaborating and a process of experimentation to get that three-dimensionality right. On Insurgent we had quite thick volumetric screens. Paul Butterworth had done a style frame that we had sent to the director in one of our treatment documents. What was sent in the document was pretty much like what we ended up with in terms of the depth and structure. It is a lot of backwards and forwards in terms of defining animations and placing them on boards in Houdini. It takes a lot of time to get it right. Kirill: Do you have some sort of 3D viewing environment where you can see how things look in stereoscopic space? 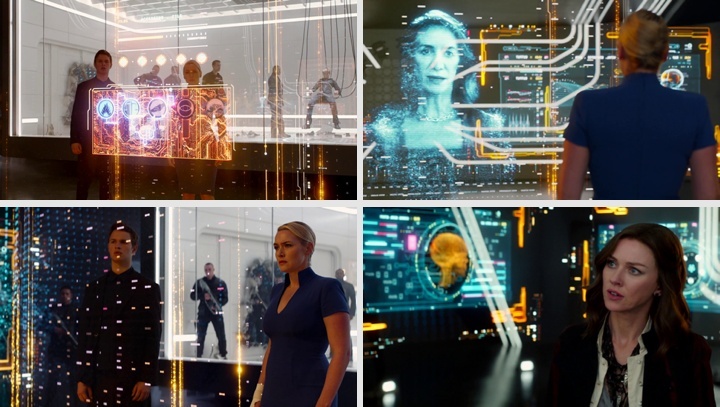 On Insurgent you had one of the main sets where Jeanine (Kate Winslet) is standing outside of the cube where they’re holding Tris (Shailene Woodley), and the camera shows Tris’s point of view that has layers of holographic imagery in between the outer glass wall of the cube and Jeanine. Anna: We can view things in stereo in the main theater, but it’s not something we use in our own reviews. To deal with the depth in 3D space we had a recipe for the cube that was in the middle of the lab. It was built in Houdini but all the graphics where supplied from Design and were essentially layers of 2D graphics. We worked out a system of what was on what layer in space. Jeanine’s cube had graphics inside, on the front, on the back, on the sides and graphics that went around the outside as well. We stuck to this recipe most of the time. The multi layers and depth of field allowed us to have that huge amount of depth. We changed things if we needed to or cheated them because it didn’t always work for the story. 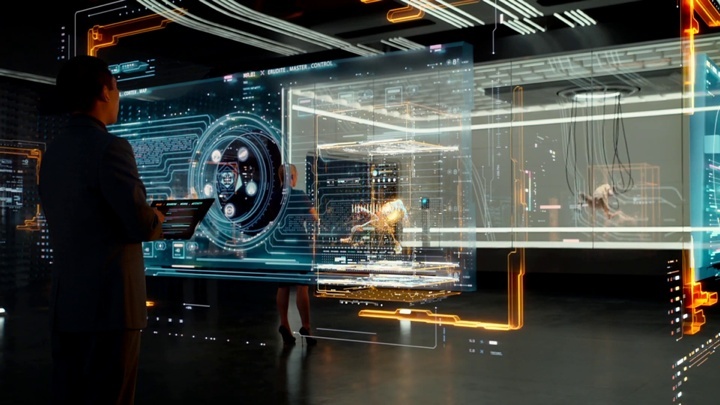 Kirill: Holographic screens and environments are very popular in sci-fi tentpole productions in the last few years, with Iron Man and Prometheus being just two examples. At a risk of asking too vague a question, do you see this a cinematic fad that won’t last for long, and how it may relate to people that want that kind of technology for the “real” world of work and home environments? Anna: It’s been going for such a long time. Minority Report came out in 2002, so it’s long time to call it a fad. People obviously have a fascination about it, and there’s something about it that works for people and they understand it. You have Google Glass, you go to a shopping center and everything has kiosks and touchpad and interactive advertising – so it’s hard to know. And I have to say that I’m not like a lot of the boys that I work with who are totally immersed in technology, I’m pretty good with technology, but I’m not someone who’s completely overwhelmed and fascinated by it day in and day out. 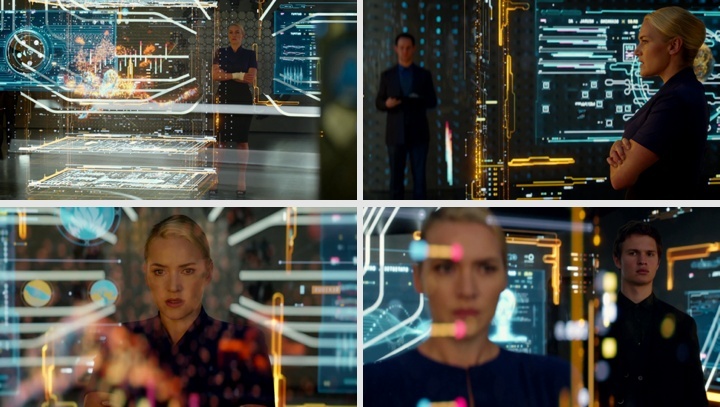 Kirill: Another aspect which is more relevant to movie storytelling is that holographic layers are done with translucent see-through imagery that allows you to put the character’s face right next to what they look at in the same frame – like in one of the scenes in Avengers where Tony Stark and Dr Banner have a conversation “through” their screens. Anna: It is absolutely a cinematic tool. It allows for complexity in the story to be told. It adds another layer to the story. Clearly twelve years is not a fad. Twelve years is a long time. 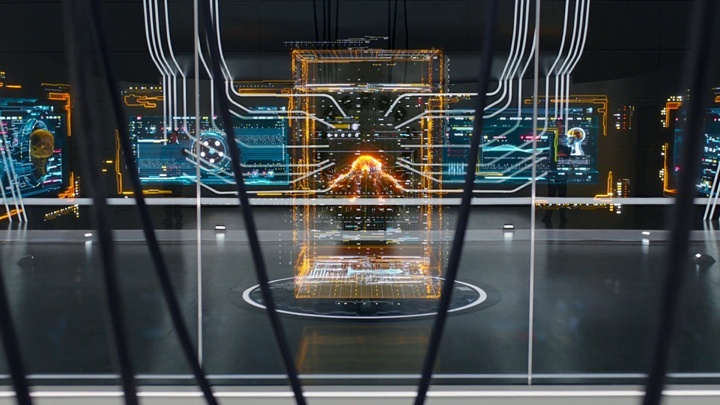 Kirill: On your portfolio site for Hunger Games 2 you say “The end result of the Motion Graphics holograms are understated, however I consider the actual design some of my best work.” Can you elaborate on this? Anna: I do have a little bit of a thing for retro-futuristic, as a lot of other designers do. In the research phase I looked at 2001: Space Odyssey, David Bowie in The Man Who Fell to Earth etc. And I do like minimalism, I’m a fan of that. Having come from visual arts where it’s about doing whatever you want and going crazy, and then learning to become a designer on the job, I actually find that I quite like the restrictions of the design. I love a good grid system, and I was able to make a system and actually stick to it [laughs]. Nobody said that we’re going to move this over there because they’re looking here. I made some panels that I really liked with some interesting shapes in a grid system, and people just let me do that. Kirill: That is also happening on big mobile platforms from Apple, Google and Microsoft that are promoting more minimalistic grid-based systems that are based on keylines, typography and white space. Anna: I think that’s why I really enjoyed it, because I was allowed to do that. You’re not always allowed to that on holograms in films, because they actually do like levels of crazy density. Your grid system usually gets messed up. Kirill: Do you think such requests come because they want to convey the complexity of information that is supposed to be shown on those screens? Anna: I do. The general thinking is that when you have more screen graphics and more tech-looking stuff, the more high-tech it is. But as you said, everybody is now about simplicity, so often simplicity to me is more high-tech than extra numbers and text that you don’t actually need. But other people may think that more is better and may read that complexity equals technology. Kirill: Do you worry about how your work will be seen and judged in 20-25 years, how it will date and diverge from what whatever will actually happen in the tech landscape? Anna: I have a teenage daughter. We went to see Insurgent and she was already bored. She didn’t understand why they needed all those screens [laughs]. But that doesn’t worry me. I personally love retro-futuristic, so I’m OK if the work that I make ends up sitting in a certain time period. Kirill: I think Alien and Minority Report are two examples of how the portrayal of a certain technology has survived quite nicely over the years that have passed since. Anna: I love Alien, the production design, the title design, everything about it. It’s very well directed, it’s a great classic movie. Kirill: Going back to your portfolio site, you explicitly mention your love of color. As we live in a global world, what is the right spelling of that word? Anna: Well, it depends on what English you speak. In they US they spell it ‘color’. I’m from Australia and I was brought up on English grammar, so I follow the British ‘colour’, but most people wouldn’t spell it like that anymore in Australia. It’s probably like my love of the grid system. Kirill: And on a more serious subject of color – do you get constrained by the production spec on which colors you can use for a certain screen in a certain environment? Anna: It’s interesting. Usually at the start of one of these productions you get some sort of brief or sentence that “we’re not worried on the color, we’re open to it” and then you think broadly. But it often ends up as cyan [laughs]. It might start off as one color scheme, but eventually it moves to cyan. I am particularly attuned to color and it’s something that I really notice and enjoy to the point that I’m even considering doing a PhD in color. Colors have meanings and they can change the whole look of a room. People ask you to take the magenta out of the red, and I look at it and think there’s no magenta, it’s just orange-red. And then there’s the technology to view it, where people on two sides of the conversation are looking at colors on different screen hardware. If someone can solve the problem of color, of communicating about color and how it’s viewed, they can possibly make a lot of money. Kirill: That also reminds me of the XKCD survey of how people name colors. There are so many different ways people can describe the same exact color, and some of that has certain cultural roots. For example in Russian we have two distinct words for blue, one for sky blue and one for deeper blue. Anna: We as a design team do our graphics in this antiquated outdated AfterEffects which is terrible with color, and then we’re sending it to comp in Nuke which is pretty good with color. That pipeline takes up so much time, purely in color. 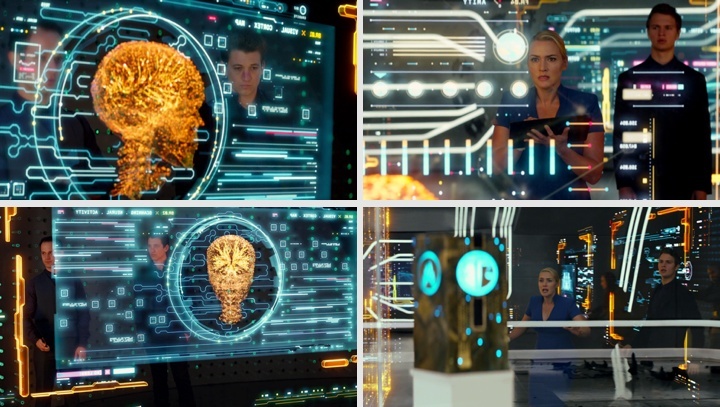 There was one whole scene in Insurgent where we spent days talking about the color yellow, about who has it right and who is doing what and if in fact it is different. Kirill: Are you the last team that is touching those scenes / frames, or is there an additional pass after you? Anna: It goes from us into the digital intermediate [DI] phase, and that’s where they do the final pass and creative adjustments. Often you see the finals go out one way and then when you see at the movie theater it looks quite different. In the DI – that’s where it can look amazing. So we are the second to last. Kirill: So you go to the movie theater, and you’ve worked for months on a certain scene and then it flashes by in a few seconds before you have a chance to point to the screen and say “That’s mine”. How does that feel? Anna: Well, if you go with your teenage daughter and you’re pointing things out, she just says “It’s gone, just stop that” [laughs]. But you’re always very proud, even of the smallest things. Like I said at the beginning, I really do like to work with teams of people. Even if it is a small thing, you know that you’ve worked together with a team to make something that looks great, entertaining, that people enjoy to watch. Kirill: And also supports the story because otherwise it gets cut. Anna: Right, it gets cut. But it can never make you feel bad. I also don’t feel bad if I’ve worked on something and the scene is cut. Sure, it might not end up in the movie. I’ve done my own filmmaking, and not everything makes it. You have to cut some things for the bigger story, it’s just part of the process, and I quite like that process. When you make those retro-futuristic documents for the director, you put thousands of things in there, and they always take out things that you like, and they pick things that you don’t like. But that’s just the process. You enjoy getting to that point, and then it changes, and you have to let it go and move on. Kirill: I am always greatly impressed to see two or three columns of names after names after names flashing by in the closing titles when I think about all these people coming together, each one with their own style and their own taste, and working on this single production where all of that talent coalesces into one story. Anna: I think it’s amazing that everyone can work together on the same production, with all these different ideas about the same story. It’s a good thing and not a bad job, isn’t it [laughs]? Kirill: Do you worry about not being able to open your files in, say, 20-25 years when the studio wants to remaster the movies to whatever holographic / straight-to-the-brain format that we’ll have then? There’s so much being created digitally these days, and so much of that is tied to specific hardware and software versions that are getting obsolete and unsupported in the span of a few short years. Anna: It’s interesting for me to find how this digital age, that we as filmmakers live in, affects the archivists. How are they going to deal with what we’re creating? If you look at the past, everything was on film which was a solid thing that people could work with. But now I just don’t know how they’re going to manage to preserve all of those files, like you’re saying. And we’re not using a single program in post-production. We’re dealing with Photoshop, Illustrator, AfterEffects, Houdini, Maya, Nuke – very specific versions. And then we have bespoke programs that have been made for that particular show. That’s a very interesting question. Kirill: You’ve mentioned a few of the software tools that you’re using these days. What are your main pain points? What can be made better in the way we communicate and interact with computers and screens around us? Anna: I think that it’s only a matter of time when the technology progresses well beyond laptops and similar gadgets. Particularly the younger generation is so adept at any technology. They just pick it up and move with it. And this laptop environment? I think it’s stuck with the older generation. As soon those younger kids start to move up and move forward, everything’s going to change. It does bother me to always have a keypad. I just get bored with that all the time. I’d like to see a more creative environment, where people don’t sit at desks chained to their keyboards, but instead operate in a more fluid environment where you can do stuff on screens and screens can be swapped and you can share things, where things can transfer without having to go through such a manual process of putting this here and there, transferring things through servers etc. It would be nice to have a world where none of that exists. Kirill: Can that be a virtual world with something like Oculus Rift where it looks like you have discrete screens around you but you don’t really? Anna: Absolutely. You can have a virtual office that you just step in to and do whatever you need to do. But for me it’s all about communication. We can have all these new ways to communicate, but we still need to be able to make sure that our communication is effective and it’s a two-way process. Often I find that communication in technology-driven environments is a bit lost. So the office of the future would be big on communication and also a much more streamlined process. It could be in a virtual world, it could be in a real-world office, but it needs to have an emphasis on communication. We’re never going to achieve anything as a single person on their own. It’s just not going to work. Kirill: Are you concerned that putting on those VR goggles puts a physical barrier between you and other people around you? Anna: The thing is that you can have a virtual world where everybody is in there together. As long as you can communicate in that virtual world together, that’s fine. You need to place emphasis on the communication. I think that really interesting things come out of communication. It’s never to be underestimated. Kirill: I was particularly intrigued by the technology vision in Her where technology has evolved to a point where it can interact with and maintain a deep conversation with its “owner”. In that world the main character doesn’t see the need to meaningfully communicate with any other human being, and I was feeling very sad to see this supposed pinnacle of artificial intelligence and how bleak of a future it has painted for us as a social species. Anna: I’ve only seen the trailers, and it’s still on my long list of movies to watch, but I completely agree. There’s something very sad in how they paint the future for the pinnacle of technology. But it doesn’t have to be like that, it doesn’t have to go that way. I watch my 18-year old daughter, and they’re all about technology, but they’re also a very sociable generation. Kirill: If anything, you could argue that all the different social networks and mobile apps allow people with similar interests to find each other no matter how far away they are geographically. Teenagers and young adults no longer have to go through a very formative stage in their lives feeling completely alone, at least in those virtual worlds. There’s so much more opportunity to find and communicate with like-minded people, to explore and grow your interests. Anna: I think that the positive side of social media is actually that it brings together groups of people who are interested in things together, and that’s a really good thing. You can only hope that virtual reality will become something like that and offices could potentially still have the element of communication and togetherness. You are in that virtual world, working on projects together. Kirill: In between your work on films, do you have time to explore other design projects? 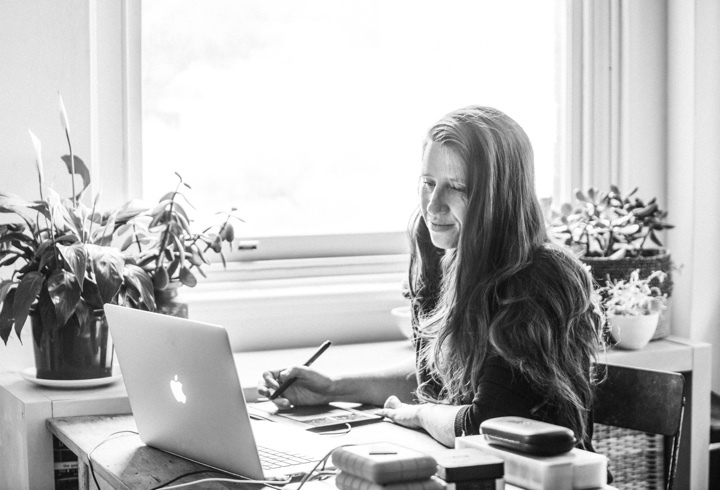 Anna: As a motion graphics designer I’m really happy to work in film. It’s about entertainment, it’s about collaboration, it’s about people. Apart from that I’ve done quite a lot of projections that are not necessarily higher-end. I work with community with a lot of research involved. I also do my own stuff which is watercolor and digital printing. Kirill: And it must be feeding into each other as you explore these different venues. Anna: Absolutely. I love patterns, and I make a lot of my own patterns. I have plans to do something with them, but not at the moment. But I find that making them is something that I often use in my film work or in my commercial work. For example, if you break down the UI, it is actually a grid of patterns. I find that it informs a lot of things there. Repetitive motifs, things that animate – I love making those, and I find that I end up using them a lot in my commercial work as well. Kirill: I look back at the last thirty years of my life and how much the technology has changed around us and how deeply it pervaded and insinuated itself into our daily lives, and I can’t help but wonder what will happen over the next thirty years, how that can possibly change the experience of movie story telling and the experience of watching those stories. It feels that we’re living through a very exciting period as far as technology goes. Anna: I totally agree. We are in a rapid period of change. It’s like the industrial revolution but in the digital world. Things move quite fast, and I think that it’s exciting and that it’ll be interesting to see where things end up. You mentioned how we’ll be viewing movies, and I was thinking back to when I was young. I was a kid in the 1980s, and the home video came out and there was a lot of talk about how movies are going to die. Certainly they shut down a whole lot of cinemas and there was always the discussion of how movies are going to die. But they are not going to. It’s just going to live on in some other format or viewing experience. People like stories. People need stories. Kirill: I also see that in the world of episodic television that is attracting big swaths of talent from the big screens. If you reduce it to the bare essentials, it’s all about telling a story, about creative artists wanting to tell their stories and migrating or oscillating between formats that let them, at this particular moment in time, to tell those stories. And underlying that it’s still the same desire to tell and to listen to those stories. I think that’s universal for us as a species. Anna: That’s right. Books, films or just people telling stories. One of the things I’d be interested in seeing is how the idea of the movie theater actually progresses. I don’t know about the US, but here in Australia audiences don’t go so much to the cinema. People from my generation still see that as an event, as something that you would like to do. But I’m not sure that it’s going to carry on through younger generations. It’s going to be interesting to see how they deal with that, how Hollywood and the film industry deals with that change. How are they going to get people into the cinemas, and if they can’t, what impact will that have on movies? And something like Oculus Rift might be a very interesting development for the film industry. I think about the the production side of the industry, particularly in Australia, and sometimes I don’t think it’s computing that this change is here. Kirill: As far as what I see happening in US, some bigger chains started converting to “premium” sitting with leather chairs with leg rests, alcoholic beverages and wider selection of food and drinks. And of course there was the big and rather clumsy wave of 3D productions mostly done in post-conversion. Specifically for me, Lord of the Rings and Avatar were the only two experience where I absolutely had to go to the movie theater on the opening weekend, no matter how many people wanted to get in. But it feels to me that a good story doesn’t need to be seen on a gigantic screen. Anna: Indeed, a good story is a good story and it doesn’t necessarily have to be in the cinema. I personally love cinema, the event itself and the social experience. I do have a bit of a lament, or nostalgia that this is being lost, which is partly why I like working in film, but that’s progress, isn’t it. Something else will come instead. I think that times will change. But having said that, I also saw Avatar in 3D at IMAX and I don’t think that I’ve seen a 3D film since then that was as good or successful at using the technology. Kirill: I think it’s still the shining beacon that was designed to be viewed in 3D. In most productions you have this random thing that comes at you and it’s just a novelty. And at some point that novelty wears off and you end up with the same generic hordes of monsters. But Avatar was a movie that you absolutely had to experience in 3D. Anna: You can see with James Cameron in Avatar that he had the concept of that world with all the floating stuff. It was like being underwater, and to me it looked like that was his concept from the beginning, that that was his reason to use 3D. He really enticed the audience visually, and I think he’s succeeded. And I haven’t seen anything like it since. And here I’d like to thank Anna Fraser for finding time in her busy schedule to answer a few questions I had about her art and craft. You can find more of Anna’s work on her portfolio site.